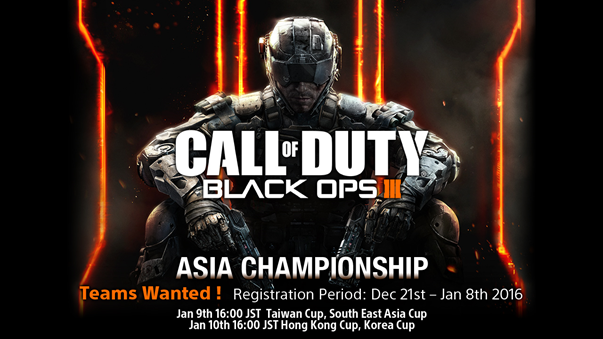 Singapore, 29th December, 2015 – Sony Computer Entertainment Japan Asia and ESL are proud to announce the Call of Duty Asia Championship! Call of Duty fans from all over the Asia-Pacific, brace yourselves for an explosive start to the New Year. During the first half of January, online competitions for Hong Kong, Taiwan, Korea and South East Asia will take place and four teams from these regions will secure their spots in the Call of Duty Asia Championship Final, to be held in Taiwan, at the 2016 Taipei Game Show. The Call of Duty Asia Championship will be featuring the latest Call of Duty game, “Call of Duty: Black Ops III”, and will be played on the PlayStation platform. On January 9th and 10th 2016, online qualifiers will be held for players from Hong Kong, Taiwan, Korea and South East Asia (Singapore, Malaysia, Thailand, Indonesia and Philippines). The top placers from each qualifier will earn the right to represent their region and compete with other regions at the main stage of PlayStation booth at 2016 Taipei Game Show on February 1st 2016. Please go to http://www.esl.gg/codasiachamp to find out the requirements and sign up for the competition!